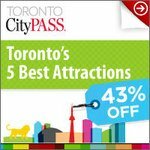 Toronto Travel Guide Top Picks for Fun, Thrill and Entertainment! Toronto events August 2013 list is chock-a-block with food festivals, outdoor exhibitions, street performances, nail-biting sports events, electrifying concerts and other amazing events. 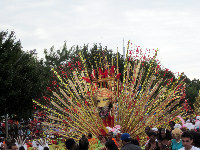 August in Toronto is really exciting as summer fun goes on with the grand Caribbean Carnival Parade. The Canadian National Exhibition (aka CNE), Taste of the Danforth and Scotiabank Buskerfest are some of the must-see Toronto events in August. If you're tennis fan, the Rogers Cup  Women's Tennis Tournament offers you great opportunity to see some of the top women players in action at Rexall Centre. Selena Gomez concert and American Idol Live! 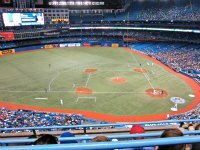 at Air Canada Centre, Toronto Blue Jays home games at Rogers Centre and free festivals, concerts and films at Toronto Harbourfront Centre will give you barrel of fun. Browse our Toronto events August 2013 listing to see what is going on in the city and mark your calendar! See July events for more details. Celebrated during the first week of August, Island Soul is one of Toronto Harbourfront Centres popular summer festivals. The event celebrates lively and energetic Caribbean way of life, its rich artistic traditions, various up-and-coming art forms and creative expressions. Enjoy Caribbean dance, music and much more. Free Admission. IRIE Music Festival is an amazing music, arts and culture festival taking place at Nathan Phillip Square in downtown Toronto. Come and celebrate all things irie! Enjoy music of all types  from Reggae to Salsa, Soul to African, dance performances, visual arts exhibitions, literature displays and international cuisine and drinks. Where: Exhibition Place along Lakeshore Boulevard W.
Caribbean Carnival Toronto Parade is characteristic element of the Caribbean Carnival Toronto and it's the most favourite attraction among scores of Caribbean Carnival events. The high profile and glamorous parade offers you the perfect opportunity to appreciate the Caribbean culture up close and personal. Get ready for the breathtaking, power-packed tennis matches as the top players in the world showcase their skills, stamina and style on Canadian courts for 9 consequent days during the prestigious Rogers Cup. The tournament is classified as a Masters 1000 event on the ATP World Tour calendar and is one of the oldest ongoing tennis tournaments after Wimbledon and the US Open. The interesting fact is that men's and women's events rotate each year between Toronto and Montreal. In 2013, the women's event is held in Toronto and promises an action-packed tennis extravaganza featuring top ranking women players. Don't miss the opportunity to see your favourite players in action during one of the best toronto events at Rexall Centre, Toronto. Buy your tickets before it's too late! Celebrating summer in Toronto, Artfest at the Distillery is a fantastic art festival in the fascinating Distillery District. More than 65 artists from across Canada will showcase their crafts and artifacts including paintings, jewellery, handmade pottery, glass, paintings, colourful clothing, photography and much more. 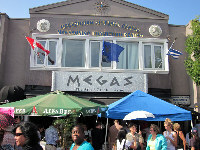 Taste of the Danforth is a celebration of traditional Greek culture and Greek cuisine. It's the biggest Greek festival in the world outside Greece, and offers authentic Greek gastronomy along with lots of exciting and entertaining activities. Explore and savour the delicious diversity of South and Southeast Asian cuisine as some of Toronto's top Pan-Asian restaurants offer variety of dishes at the Harbourfront Centre. The three day long food and cultural festival celebrates Asian culinary trends, traditions and cultures. The Fortune Cooking Festival also features tons of cultural offerings, including dazzling dance performances, melodious music and amazing arts. Roundhouse Craft Beer Festival offers you opportunity to sip and savour Ontario's best and authentic Craft beer in the heart of downtown Toronto. Taking place in Roundhouse Park near Rogers Centre and CN Tower, the festival showcases only the best Ontario craft brewers famous for crafting premium beer using the finest ingredients in traditional way. Sample the tangy ales, crisp lagers and enjoy tasty bites from some of Toronto's best food trucks. Dont forget to bring blankets or picnic chairs. If you love the tormenting tastes and alluring aroma of jerk food, Toronto JerkFest is a remarkable food event that you should not miss. Celebrated annually on second weekend of August, the festival is a great combination of world famous jerk cuisine, dazzling music, and fun activities. You can sample and savour variety of hot, spicy and juicy meat and vegetable dishes along with icy-cold beverages. Kidz Zone is a centre of attraction for children and offers face painting, rock climbing, midway rides and many other interesting activities. The entertainment lineup features international Reggae artists and singers offering non-stop live performance. The Hot and Spicy Jerk Chicken Eating Competition is also very popular among the food lovers. Toronto Queer Arts & Cultural Festival (formerly known as Queer West Fest) educates and entertains people through performing arts, films and related workshops. The ten day annual festival offers a wide range of cultural events and artistic shows by Queer community of Toronto. A film festival, spoken words event, a Youth Unconference, art gallery and alterna-queer music concert  you will find something out-of-box to arouse and amuse almost everyone. Celebrate summer at the Canadian National Exhibition (CNE) and enjoy the incredible sights and sounds it has to offer. 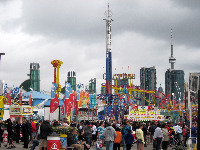 Being the largest fair of the Canada, the CNE offers an astonishing array of attractions and events for 18 days. 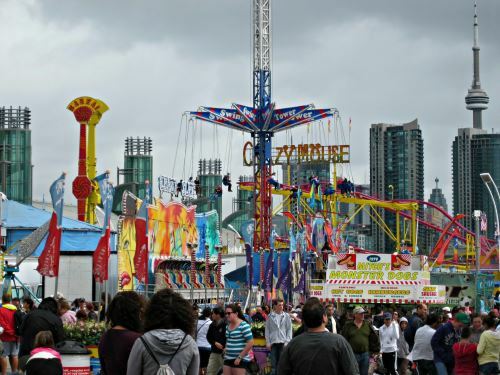 Enjoy the exciting exhibits, more than 60 rides and games at midway, live concerts and events, shows, parades and competitions at one of the best Toronto events. With over 25,000 revelers, the annual York-Eglinton International Street Festival is quickly becoming one of the fastest growing multi-cultural street festivals in Toronto. The three day long street carnival showcases rich and multi-ethnic cultural diversity of Toronto. The family-friendly festival features a wide array of music, dance, arts and cuisine representing Caribbean, Italian, Latin American, Portuguese, and other cultures. Enjoy live musical performances, delicious food, vendor displays, fun activities and much more. The festival is held along Eglinton Street West between Oakwood Avenue and Dufferin Street. FREE ADMISSION! Mabuhay Philippines Festival takes over Harbourfront Centre for three days to celebrate Philippine Arts, Heritage and Culture. The event offers a wide range of live performances, dance, music, and culinary delights. The festival theme for 2013 is "Ang Pinagmulan" or "Our Roots", featuring the evolution of art, music, dance, fashion and culinary arts and how it continues to influence Filipinos today. Organized by the Philippine Independence Day Council and considered as one of the largest celebration of Filipino culture, the festival allows you to experience and explore traditional and modern Filipino culture without having to leave Toronto. The Scotiabank BuskerFest is one of the most popular and widely anticipated events of August. For four days and night, Toronto's international busker festival features more than 100 extremely talented street performers, showcasing some of the most incredible and jaw-dropping performances. Enjoy and experience colourful comedies and slapstick, mind-boggling magic shows, amazing acrobatics and circus acts, clever and sharp jugglery acts, an assortment of music and much more. Get ready for spontaneous acts that are extremely wild, wacky, and weird! Fan Expo Canada is Canadas largest pop culture event and fan convention held annually at the Metro Toronto Convention Centre. The event offers great opportunity to meet like-minded people and experts. Come and join the celebration of all things comic, Sci-fi, horror, anime, manga, animation, gaming and much more! The event offers exhibitions, seminars, autograph sessions, and workshops featuring industry professionals, artists and celebrities. You can buy your favourite comics and games from vendors. You may also find some unique and rare gaming console and tools. TaiwanFest is a three-day event celebrating the rich and diverse Taiwanese culture, and showcasing Taiwan's best food, music, dance and arts. The festival offers a great fusion of interesting activities including cooking demonstrations, live music and dance performances, films, exhibitions and lectures from some of Taiwan's top performers. Held at Harbourfront Centre, this festival is free for everyone. The theme of this year is "Children of the Ocean". If you love spicy - extremely spicy food, then come out at the Harbourfront Centre for the Hot and Spicy Food Festival to spice up your taste buds. The sizzling hot festival features variety of spicy food from around the world. Savour the flavour of some hot, spicy, salty and exotic delicacies offered by various vendors and buy some hot sauce to stock you own kitchen. The festival also offers music, dance, cooking demonstrations, marketplace and the crowd-puller Iron Chef Competition. Experience splendid sights, sounds and smell of everything Spanish as the Hispanic Fiesta brings the flamboyant Hispanic culture and heritage right into the heart of multicultural Toronto. The annual event offers live music and dance performances, arts and crafts displays, popular tango show and Spanish food from around 20 Spanish speaking countries. More than 300 local and international artists show their talent and skills at this amazing festival.